With credit due to Albert F. Heino Architect , Clerks of Session, Elders, Trustees, Deacons, Pastors, Many Church Booklets, the Oral History and the Saints. July 6, 1890, twenty-nine people from Morgan Park met to discuss the need for a Presbyterian congregation in community. Public worship services were held in the Blake Hall of Morgan Park Academy for several months. These individuals formed The Morgan Park Presbyterian Association which petitioned the Chicago Presbytery to charter a Presbyterian church in Morgan Park. May of 1891, the Reverend Edwin Davis left Morgan Park to assume the position of Stated Clerk for the Chicago Presbytery, and the Reverend W.R. Scarret was named pastor. Under his leadership, the congregation undertook the important work of finding a permanent location for worship. In 1892, Mr. W. G. Furguson donated a parcel of land on Longwood Drive in Morgan Park for the construction of a house of worship for the new congregation. The surrounding community was connected to the city of Chicago by the Rock Island train line that is located across the street from the new location. The original church building was erected on the site of the present building during the year 1892 and was dedicated January 15, 1893 with the charter number of 46. Despite the fact that Reverend Scarret left Morgan Park after only four months of ministry, the first annual report, for the year 1892, reflected the generosity of the members. Contributions that year not only covered the complete construction of the first church building, but also included: benevolent contributions to home and foreign missions, aid to denominational colleges, contributions to hunger relief, and gifts to the assistance of freed slaves. 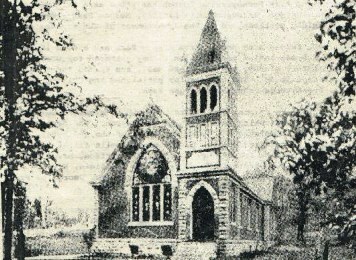 In the fall of 1892, the congregation worked to provide a growing ministry in Morgan Park. The session found it difficult to attract pastoral leadership and often relied on the preaching of ministers who were delighted to spend a day in the country. The Reverend W.D. McFarland led the congregation for 8 months until 1894 when the congregation called Rev. Wilson A. Eisenhart who remained until October 1, 1900. Following was Reverend Sherman L. Divine for two years; Reverend Alexander Patterson for three years and Reverend Clyde Lucas from 1908-1913. In December of 1931, the congregation was able to call the Reverend Leason Sharpe, an Englishman who was known for his intellectual power, his inspiring leadership, and powerful preaching. The congregation and the Reverend Sharpe could not have known how important his gifts would prove to be for the future of the church. The Reverend Samuel W. Findley was called in 1914 and stayed until January of 1930. Dr. Millford Hall Lyon came in April of 1930 and stayed until April 1931. 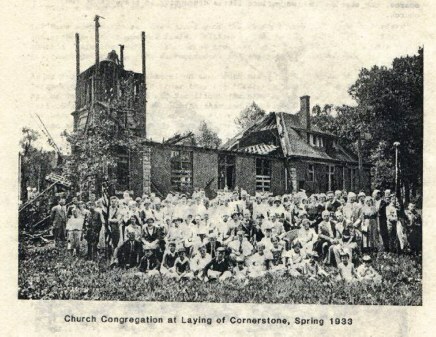 On the night of January 19, 1933 the original church building was almost completely destroyed by fire. Although this crushing event occurred at the very depth of the depression, the congregation bravely determined to rebuild at once. Some counseled against it, but the strong faith of the majority prevailed. 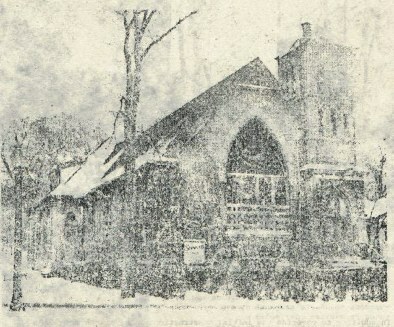 Despite widespread unemployment and the limited resources of the members, Morgan Park Presbyterian Church dedicated a new place of worship February 18, 1934. A stone had been selected from the old church and was fashioned into the "founder's stone," marked with the date 1891. The cornerstone was laid on October 1, 1933. The founder's stone was laid in the corner of the new church by; Elder William S. Kiskaddon. Resting on the "founder's stone" is the corner stone of the new church building marked with the date 1933. The cornerstone was laid by the Reverend Samuel W. Findley. The lower portion of the church was completed in 1933 and was dedicated on Sunday February 18th, 1934. 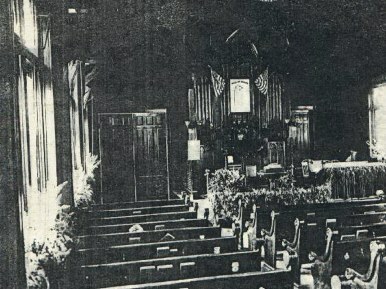 The congregation worshiped in this section which is now the building's Westminster Fellowship Hall. When Dr. Millford Hall Lyon left after only one year, the congregation experienced a great deal of turmoil in the congregation. The Presbytery quickly appointed Dr. Robert Clements as Interim Supply who united the congregation in spirit and purpose until the call of the Reverend Leason Sharpe who remained until 1945. After several months with interim supply, Rev. Robert Sawyier the church called Dr. William C. Graham in April, 1945. As the war ended, many couples married, purchased homes in the community, started families, and joined Morgan Park Presbyterian Church. The new members found themselves challenged and invigorated by the ministry of a new pastor. Dr. William Graham accepted the call as pastor to Morgan Park Presbyterian Church in 1945, and began the longest pastoral tenure to date. Dr. and Mrs. (Helen) Graham's leadership brought many children and youth into the congregation. Children's choirs, youth music programs, Boy Scouts, and Church School required tireless dedication on the part of the church's staff and volunteers. By the early 1950's Dr. Graham's enthusiastic leadership brought about congregational growth. As the community grew the congregation found its facilities inadequate for Christian education and fellowship. During the 1950's and 60's, while constructing our current Church School buildings, Morgan Park Presbyterian Church members not only expanded congregational programs, but also increased their contributions to foreign and local missions. Often special offerings were received for neighborhood settlement houses and the Presbyterian Home. The deacons also directed a hospital equipment loan program, which provided free use of medical equipment for members of the congregation and community. In 1969, after nearly a quarter century of ministry in Morgan Park, Dr. Graham retired. The whole community joined to express their best wishes to Dr. and Helen Graham, who had faithfully served the congregation. After a lengthy pastoral search, the congregation extended a call to the Reverend Roy Schneider in 1971.These were difficult times for congregations across the country and in the city. Several members of Morgan Park Presbyterian Church had moved to suburban homes west of their former community. Still, ministry continued at Morgan Park Presbyterian, in addition to his gifted preaching, the Reverend Schneider recognized a need for greater fellowship among members. At his prompting, several groups volunteered to sponsor time for coffee and conversation following each Sunday worship. In the late 1970's, many Chicago Presbyterian churches closed their doors for the last time, but Morgan Park Presbyterian Church maintained a vital Christian ministry. Reverend Jerry L. Hazen, who celebrated his marriage to his wife Colleen while pastor. Reverend Hazen expanded the congregation's vision and, with the special assistance of Elders Cliff Parker and Richard Johnson, Morgan Park Presbyterian purchased the home at Longwood & ll0th Place, and in 1979, dedicated a new parking lot. In addition, the Reverend Hazen encouraged the congregation's participation in community and denominational ministries and encouraged the congregation's growth to reflect the community's diversity. The interim leadership of the Reverend Fred Milligan directed the congregation's search for a new pastor. Reverend Milligan was instrumental in reorganizing the committee structure of the congregation and initiated the development of a Worship and Music Committee led by Elder Dr. Maribeth Montgomery Kasik. Reverend Milligan was very active in community activities such as the Ridge Run and Heart and Soul walk through the community. During his tenure, the Children's choir was started as well as a strong emphasis on music in reformed worship. Reverend Milligan had specialized training in Urban ministry and strongly encouraged the participation of members at the Chicago Presbytery. As an Interim pastor, Reverend Milligan had under his care a very "young" seminarian named Jonathan Krogh. In July of 1988, following his ordination, the new Reverend Jonathan Krogh was called as pastor. During the beginning of Reverend Krogh's pastorate, the church continued on an upward swing in both activities and membership. There were new programs for High School Youth, All Church Retreats and Picnics as well as a highly successful LOGOS after school program. During this period the church had two commissioners to the General Assembly. Jonathan had specialized training in counseling and left MPPC to pursue his calling as a counselor and teacher. December of 1992 brought another test of faith for the congregation as the church was engulfed with flame and nearly destroyed a few weeks before Christmas. The fire completely consumed the remains of the original church which was affectionately known as the Fireside Room and Ladies Parlor. The upper floor Sunday School Wing fell through the fireside room and into the Medical Supply Room off of Westminster Hall. Westminster Hall filled up with black sooty water with the contents submerged. The fire stopped short of the sanctuary but sent heavy heat, soot and water damage into the nave. Many of the stained glass windows were lost and many more would have been lost if Reverend Krogh had not stopped the fireman's ax as they tried to vent the smoke and heat above the lancet windows. Many of the members of the congregation were at the church before the fire department had the flames put out ready to work. Immediately, congregates began working on salvage and preparing a space for Sunday worship in the Christian Education Wing. Christmas Eve Services were held in a very sooty sanctuary with special permission from the fire inspector. 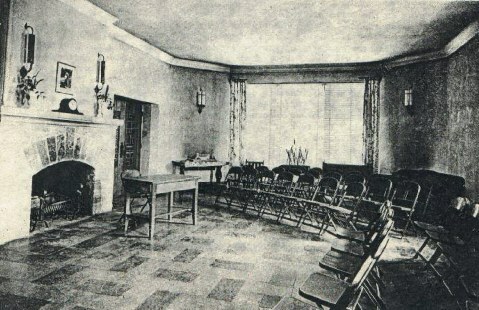 Following that special service, worship for the next year during reconstruction was held in Westminster Fellowship Hall much the same as in 1934 after the 1933 fire. (Video footage of the fire can be found on YouTube). The congregation was to find that recovering from the fire involved spiritual recovery as well as physical recovery. Upon the departure of Reverend Krogh, Co-Interims were supplied to the congregation: Reverend Ensign Leininger and Reverend George Thompson. Reverend Leininger attended to the pastoral care and Reverend Thompson to the weekly preaching. 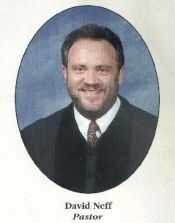 Reverend David Neff was called to MPPC in 1997 and led the congregation into the millennium. The church began capitol campaigns to raise money to make necessary repair to the basement, Westminister Hall, the patio, basement restrooms, condensate piping etc. Reverend Dr. Neff 's final Sunday as our Pastor was July 1 2007. He was called to teaching and accepted a position at Trinity Christian College and has since been called to other congregations. Upon Reverend Neff's departure, the church utilized seminarians,and pulpit supply until the Interim Pastor was called. Interim Pastor Reverend Edwyn Dykstra was called September 2007 to lead the congregation into its new future. Rev Dr. SanDawna Gaulman Ashley was called as pastor on Sunday May 10, 2009 Her first Sunday was July 19th, 2009. Rev. Dr. Ashley was called to other ministeries in the PCUSA. Rev. Jane Tuma was called to MPPC in September 2011 and is it's newest pastor. Morgan Park Presbyterian Church has stood as a witness to the Gospel of Jesus Christ since 1891, . Throughout its history, Morgan Park Presbyterian Church has tangibly participated in the advancement of the Kingdom of God. Today, Morgan Park Presbyterian Church is still growing as an expression of the Kingdom of God in the world. When we build; let us think that we build forever. Let it not be for the present delight nor for present use alone. Let it be such work as our descendants will thank us for, and let us think, as we lay stone upon stone, that a time is to come when these stones will be held sacred because our hands have touched them, and that men will say as they look upon the labor and wrought substance of them, "See 1 This our fathers did for us." (John Ruskin at the dedication of the Sanctuary on April 20th, 1941). The principal divisions of the Church interior are the Nave and Chancel. The Nave contains the pews where the members of the congregation are seated for services. The word Nave comes from the Latin meaning ship, which is often designated as a symbol of the Church. The Nave has also been symbolic of the "Church Militant". The lacy carvings of the powerful, traditional piers rising majestically to frame the windows contrasts the severe simplicity of the altar with its admonition "Abide in me and I in you." "The magnificent Chancel signifies the "Church Triumphant" and contains the Presbytery where the choir is located and the Sanctuary where the Altar is placed." The center of attention is focused on the powerful redos built around the glorious triple Chancel windows and making them a part of the wall treatment. These windows are 114 feet from the east wall to the tower room. The three divisions over the Altar in the reredos represent the Trinity as do the triple lancet windows over the reredos. The three panels of the reredos have the carvings Sanctus Sanctus Sanctus or Holy Holy Holy in the canopy. The throne at the base of the altar cross contains a sacred monogram "IllS" which is a contraction of the Greek word "IHCOYC" meaning Jesus. In Biblical times, the letter "Sigma" was written as a "C". The rich coloring of the windows is brought down to the altar by the use of silk panels of ecclesiastical color. The three red tapestry panels of the reredos represent the blood of Christ which brought about our redemption. The Angus Dei or Lamb of God carving in the frontal of the altar is the universal symbol of Jesus.